Are you thinking about updating your landscape design? O’Grady’s Landscape can help! We have been providing comprehensive landscaping services to the Northern Virginia area since 1991, and we have the skills and experience to handle any project. Whether you want a patio for outdoor entertainment, a beautiful arrangement of plants and flower beds, or both, we will provide you with a custom landscape plan to complement your home design and meet all your needs. If you’re ready to start planning, request a proposal today! We serve homeowners in the City of Falls Church, Great Falls, North Arlington, McLean, and Vienna. When you call us to design and install a new landscape, plant, or hardscape design, we’ll be there for you every step of the way. The landscape planning process begins the second you request your proposal—we’ll start gathering some basic information from you, including a brief description of the work you would like, and schedule your consultation with the best landscaper for the job. During your initial consultation, your landscape planner will meet with you and walk through the property to discuss your project. We break jobs down into discrete “projects,” such as a patio, walkway, or privacy screen. All our estimates include a written description (and possibly a drawing) of each project. Most estimates consist of three or four written projects with a drawing of the work. Estimates are free and are usually delivered within a week. The actual estimate and drawing are created back at our office. Our landscape planners review notes and photographs of the property. We consider all of the information gathered during the initial consultation to produce a landscape plan that is attractive, functional, and suited to your needs. We are prompt in getting proposals out to our Northern Virginia clients; you can expect a complete landscape plan within a week of your initial consultation. When you need a landscaper in Northern Virginia, call O’Grady’s Landscape! 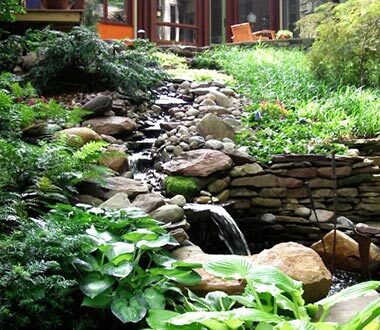 We offer comprehensive landscape design services from start to finish and that includes providing each client with a custom landscape plan based on their needs and the scope of their landscape. We can help you plan out all stages of your project to ensure successful completion, on time and on budget. Ready to get started? Contact us to schedule your initial consultation today.